Amongst my many tried and tested work avoidance techniques is trawling eBay for things I can’t afford or don’t need. This morning I hit a cool seam of small cars in the classic car section. It started with this a “Mini EL” electric trike, which has a sort of ’80s vision of the future’ vibe to it. A more practical (but still single seater) Sinclair C5. Needs work to get running, and then lots of forms filling out to register to drive on the road. 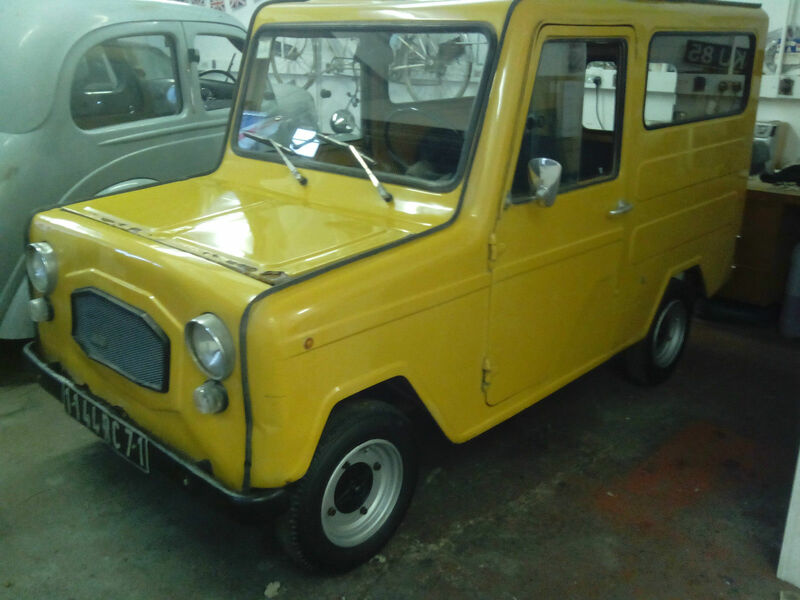 The Mini EL led me to this Lambretta micro van, which looks just like a yellow version of Postman Pat’s van. Ugly but endearing, and sort of practical. The micro car theme continued with this Vespa, which has the cutest little face and rear opening ‘suicide’ doors. It needs a lot of work, with the floor all but gone and engine seized, but it’s just begging to be lowered a little, painted a deep glossy red or blue and powered by a new bike engine. This Goggomobile isn’t as cute as the Vespa, but it’s in better condition. Again, it needs a new engine, but if you’re already on eBay, that shouldn’t be a problem. So, that’s how I waste time on a Sunday morning. These are just the cars I looked at that I could string together a theme about. I expect one of you with more money, space and mechanical ability to take one of these and produce an awesome miniature kustom car. Or wait until I’m selling enough books to afford to do the project myself. There’s a replica of Mad Max’s V8 Interceptor for sale on eBay right now. It’s currently at £79,995, but it’s one of those cars you’d just have to buy if you had the money. …so it wouldn’t have to be practical. At least, that’s the excuse I give myself when I skim through the eBay classic cars section looking for things I’m not really going to bid on, like this dragster inspired Mk1 Ford Cortina. When I was a kid our neighbour ran a Lotus Cortina lookalike in local rallies, so I’d be more inclined to that look than the gasser, but it’s still cool. I still lust after a Citroen DS, and they’re still available at sensible prices. I’d rather like a Traction Avant as well, but this one needs a bit of work. A World War 2 era Jeep would be cool, but that machine gun on the back of it is obviously fake. I think I need to own a hot rod, such as this model A pickup or this 1932 Model B at some point in my life, even if it was only used for a few days at the height of summer. If I wanted to scare other drivers, this 1978 Ford Thunderbird could be the right vehicle. I think it looks like the eponymous demon possessed automobile from The Car. Alternatively, I could try to play the hero and pretend to be Starsky (or was it Hutch) in this Ford Gran Torino. I could spend the rest of the day doing this, but I’d better stop, and think about something nearer my price range and expertise- like an old Raleigh Twenty shopper looking for restoration. One of the most watched items on eBay at the moment is this guide to building stills and the art of distilling. I already know one person who brews beer and makes mead. Maybe I should buy him this so he can step it up a level and build a still in his shed. £59,995.00, or a serious offer will get you this piece of authenticated Banksy artwork. You’ll have to collect it yourself, because the postage for a safe is extortionate. The asking price is $21,000,000.00 (approximately £12,835,401.26 by eBay’s calculations), which is a bit much when you can find it listed at Saatchi Online for $5,900. There are a few paintings listed on eBay at stupid prices, is it some attempt to garner attention or play the search engines? Sadly Ebay won’t let me easily embed the image on here, you’ll have to click through to see it in all its glory. You have one day to buy this unique bust. This resin bust was inspired by the “Walking Dead – Bicycle Girl Zombie” and has been sculpted, cast in resin and handpainted by myself. The bust features some amazing detail including – Dead Kens head – with exposed brains, Barbies broken arm and hand, a Severed Barbie doll foot, exposed ribs, torn off jaw, skeletal backbone, torn and wrinkled flesh, Barbie hair, flocked base with swamp effect grass, dirt and sticks. This is a truly amazing piece and features an outstanding paintjob, including zombie toned flesh, veins and blood splats etc. Unfortunately the pictures do not do this piece justice as they show up very red for some reason, and also the gloss wet look varnish has a bit too much shine on camera. “I want one” – Everyone who has seen it so far!! My “Oh wow!” moment of the morning was finding a seller on eBay offering remote control models of Donald Campbell’s last Bluebird boat. They’re available in 1:6th and 1:10th scale. The South Manchester Model Boat Club get their boats out on Platt Fields boating lake on Sunday mornings. It would be mean to turn up with one of these and blast it around the island. Today is my day to covet cars I find on eBay. I’m watching Top Gear on iPlayer and not being impressed by the supercars, as usual. I’d rather have something like this Ginetta G15, a two seater sports car powered by a Hillman Imp engine. This one’s got a few race inspired modifications, including a rather funky front spoiler. It needs a little work, but at £4,300 it costs less than the wheelnuts from a Lamborghini. Less sporty, but in its own strange way a bit exotic, is this old Russian Volga. For £1,850 I could see it becoming the basis for a very special lead sled. Back onto sporty cars, how about a Datsun 260Z, or Sunbeam Alpine? As this is me day-dreaming about classic cars I’d usually end the post with a Citroen DS or Traction Avant, but I can’t find any listed today. 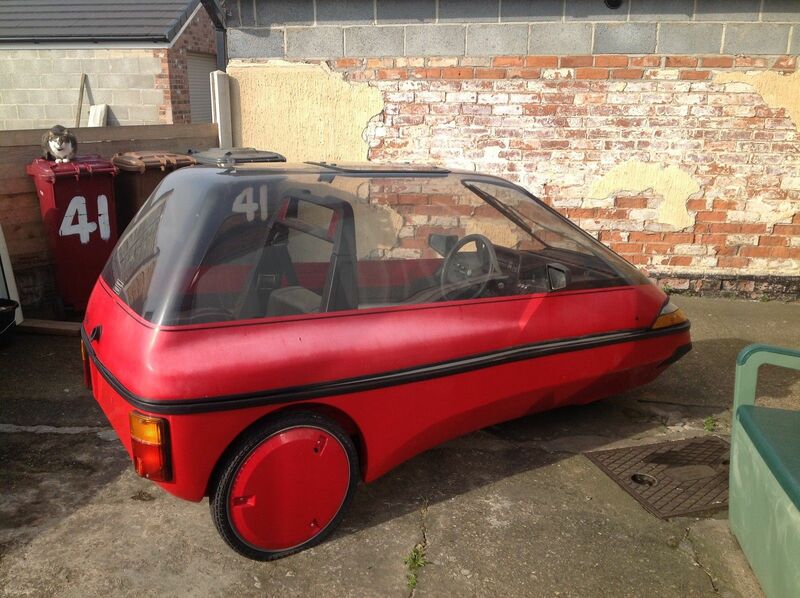 I’m still surfing the strange and cool cars on eBay, and have just found a Batmobile. It’s one of three based upon the TV series car, produced for promo work. £23,000 will buy you the right to say “Atomic batteries to speed” every time you go for a drive. 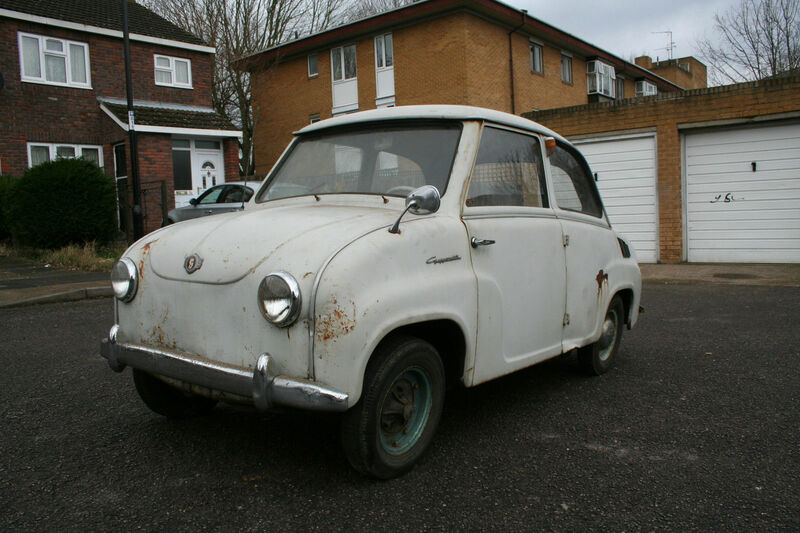 It’s Sunday, I feel like having a look on eBay for silly vehicles I’d love to own if money, storage and sense were no object. If the North Pole keeps on warming up and pushing Arctic winds further South for longer periods, then we can expect many more winters like the this year’s and last’s. It may be time, then, to invest in a Snowcat, aka a Volvo BV202 NF1. This funky vehicle, as used by multiple armed forces, exerts a low ground pressure so it can travel over snow and swamps and even float, driven through the water by its tracks. There are two for sale, but they’re both in Romania. If that’s too far, or the price is too steep, and you already have an off roader then maybe you only need to invest in a snowplough attachment. Or you could restore this vintage snowmobile. Closer to home are two examples of another beloved old military vehicle- the Willys Jeep. 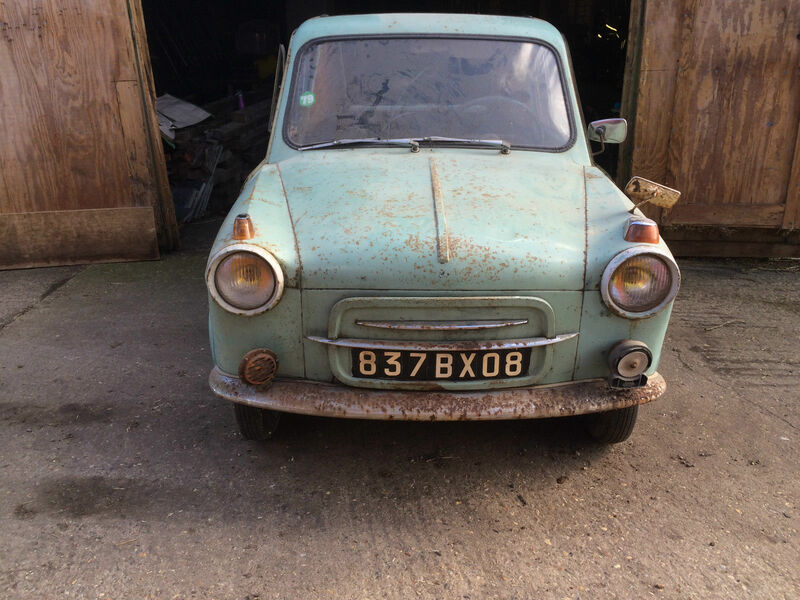 One is listed at £2,500, is missing a gearbox and hasn’t run for at least 35 years. The other is at £5,500, but at least runs. Of course, sometimes you just hanker after the quiet life and want the neighbours and the kids to shut up for a while. If gentle reasoning hasn’t worked it may be time to break out the armoured riot van, as used in Northern Ireland. If slow and steady is more your style then maybe you need a road roller. Around here I could use it to do a public service and fill in all the potholes. This engine looks complete, the turbine turns freely. I would not say this would be suitable for aircraft use. Buyer must know what they are doing with this sort of item, if you kill yourself playing with it dont blame me. This should be fully services by a suitable qualified person. Buyer to collect, cash on collection or paypal before collection. Hurry! The sale ends soon. In Soviet Bulgaria, model builds you! Here’s some interesting finds on eBay. Soviet era Russian models, of British cars. The Bulgarian seller has listed three 1:18th scale car kits- a Vauxhall of some type, a Jaguar E Type and an Austin Morris. It seems odd that the Soviets would want to make models of Western vehicles, particularly such decadent items as an E Type. The models came with an electric motor, though not all three listed still have theirs. I must resist the temptation to bid and find out more. It seems like a good time to list other stuff Harry and I have on eBay. For anyone looking for a challenge, Harry has a job lot of bikes for sale. You’ll have to collect them, because there’s no easy way to ship them. He also has other bike, vintage and random sales going on. I have various bits and pieces listed at the moment, and I’ll probably be adding comics, models and art soon as well. The job lot link should be valid as long as the auction’s running. The other two will be okay as long as we’re selling stuff. You are bidding for the affections of this man, a Spanish speaking manufacturer and creator of kings. Yes, if you need a king swiftly fabricated, then this is your man! May be interested in part exchange for electoral reform and break-up of financial institutions, WHY – cash either way. No “buy-it-now” price but make him an offer and he’ll do you a deal! Citizens of Warrington, or anybody else with access to a trailer, you can own your own Batmobile. Okay, it’s only the body, you’ll need to supply your own chassis and running gear. It’s from the Tim Burton movies and whilst that’s still cool as, it’s not a Tumbler. My surfing of the Ebay classic car pages also turned up this Daimler Conquest/Century which is also a star car, having been in Heartbeat. A few weeks ago I said I wanted a Mini monster truck, and now I’ve found one. It’s a Mini Clubman body on a Suzuki Jeep chassis. Not as huge as Bigfoot, and Clubman’s aren’t as attractive as proper Minis, but it’s a start.